Situated in spectacular Whaler Bay a quick 5 minute walk from the Sturdies Bay Ferry Terminal and all amenities - A calm serene bay with stunning views down the bay and beyond, perfect for swimming, paddle boarding and launching your kayaks or canoes. View our resident kingfisher perched on his pole, otters playfully frolicking stirring the glass-like water, watch for 'Sammy' the seal who comes round in the evening to check things out and watch the herons skillfully fish for their dinner. Galiano is also the perfect spot to see the many pods of whales that travel through our waters in the summer time. We are available for rent year–round. So cozy–up to the wood burning fire and enjoy a good book in the winter or sit out on the deck with a refreshment on those hot summer days. Recently redecorated bright open–space living & dining area with a cozy fireplace. Fully furnished 2 bedroom cottage, 1 queen and 2 double beds, and 1 full bath. Our fully supplied kitchen comes stored with dishes, cookware and appliances so you don't need to worry. The fireplace is a cozy accessory for those crisp winter days and fall evenings. The large 300 sq. ft. deck is the perfect place to relax on the deck chairs and enjoy the beautiful sunsets and views of spectacular Whaler Bay. There's also a propane barbecue so you can grill up your summer faves. Enjoy the bounty of Provincial Parks, spectacular views, and wildlife every where you go and breathe that fresh island air. 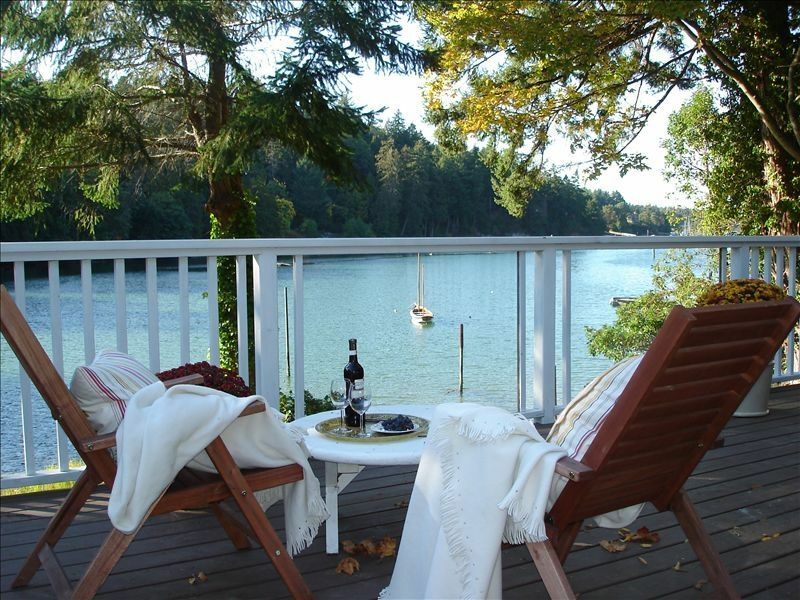 The natural beauty of Galiano Island invites relaxation, exploration and excitement. Indulge in a bottle of wine and perhaps head down to Montague Harbour and pick up a fresh catch of local seafood the island has to offer. Clean white cotton sheets with down comforters. Loved this little clean, peaceful getaway on the water. The kitchen was well stocked and the beds comfortable. A kingfisher even made an appearance! Well maintained, great view, fantastic get away! This vacation home is nice and close to Scoops (great burgers and icecream) as well as the coffee shop! These quickly became 2 favourite places to go. The information in the basket on the buffet table was so helpful! We went to some of the parks and really enjoyed the views and beaches! The Montague Park was lovely --shaded walks and beautiful beaches. We had a lot of fun going through the old VCR tapes and DVDs... lots of great old films there! All in all it was a lovely week! Lots of fresh air and sun shine and a wonderful place to retreat at night. Just loved it! Lovely home. Conveniently located. Very clean. Thank you for taking the time to leave a review. Would love to have you stay again in the future sometime! We all loved it..it took a day to slow right down. I loved no cable and wifi..we all did even my husband. It’s well appointed; the kitchen has everything you need..rarely see coffee grinders and good blenders. Very clean. Very handy to the ferry. Can’t wait to come back. Thank you so much for taking the time to leave a review. Glad you enjoyed the cottage and Galiano island. Would live to have you back in the future! Has everything for a relaxing getaway. No need to bring a vehicle. Five minute walk to ferry, shops, restaurants and spa. View of the bay, lovely large deck to sit with a cup of coffee, all cooking amenities. Beds so very comfortable! All rates are based on single or double occupancy each additional person add $20/night or $120/week. Minimum stay is 2 nights, 3 over holidays and long weekends. Weekly bookings only during July, August and over Christmas.